Points tracking on Apple Watch, iPad, iPhone and iPod! So you've got a few pounds to lose and you've tried everything but still have no significant results? Well look no further because it is a proven fact that people who write down what they eat can nearly triple their weight loss, and ProTracker Plus does just that for you. Carrying a pen and paper with you all day is not the most practical way to keep a food diary, but with ProTracker Plus you'll always be just one touch away from your food diary. It has all the benefits of a paper tracker plus much more. Simply put, this app will help you lose weight and keep it off. You can have all these benefits and avoid the monthly fees for a low one time price! Diary – Track your food, exercise, weight and healthy checks on a daily/weekly basis. Apple Watch – View a glance of your day on the Apple Watch. Weight Tracker – Track your weight each week and view your weight loss progress. Barcode Scanner – Over 250,000+ UPC's available. Barcode Submissions – Submit barcodes that are unavailable for addition to the database. Online Food Database – Over 130,000+ restaurant data + USDA foods. Meal Builder – Build customized meals by grouping various foods into one item. PDF Reports – Generate PDF reports that show you a summary of your week. These reports can then easily be emailed, printed or saved. Charts – Nutrition and Category breakdown charts give you a weekly breakdown of your food consumption. MyFoods – Build your own list of foods that you consume in your daily life. MyExercises – Build your own list of exercises that you perform. 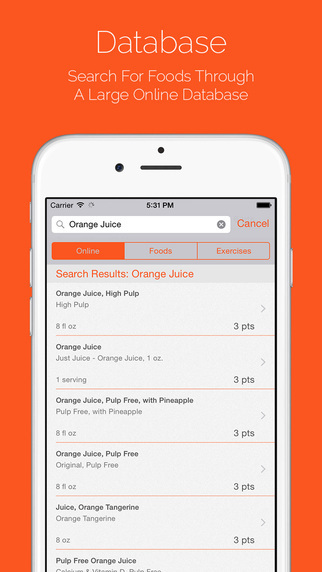 AirDrop – Share foods in your MyFoods list with nearby people. Calculators – Quickly calculate the food score and activity score of various items. Pocket Guide Database – Handy offline pocket sized database with over 700 foods. Healthy Checks Tracker – Keep track of the healthy foods you eat daily. 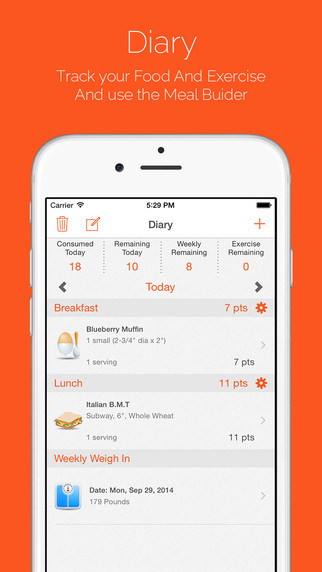 Daily Tracking Reminder – Set Daily Tracking Reminders for Breakfast, Lunch, Dinner and more. Weekly Weigh-In Reminder – Set a reminder to weigh yourself. Macro Nutrition – Add this information (Fat, Carbs, Fiber, Protein) to foods you create for better accuracy. Automatic Daily Target – Your daily target is automatically adjusted for you as your weight changes. Copying – Create new foods, exercises and meals by copying from your existing entries. Units – Support for US, Metric and Stone units. Offline – ProTracker does not require an internet connection to work! Design – Extremely user-friendly and intuitive to use. • Apple Watch support! View a summary of your day and week on your Apple Watch! • This update contains some minor bug fixes.